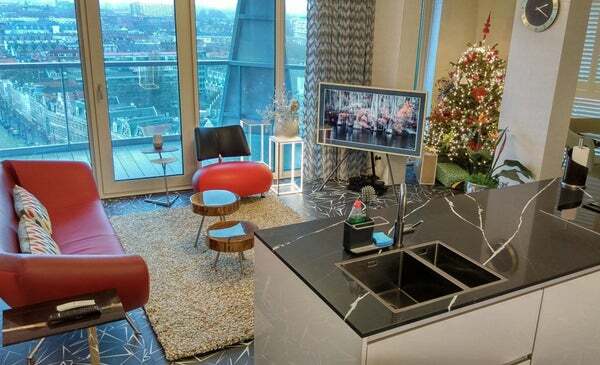 A luxury 14th floor fully furnished apartment in the heart of Rotterdam. It’s just four minutes walk from the Central Station Rotterdam with fast connections to The Hague, Amsterdam, Schiphol, Antwerp, Brussels, London and Paris. You can find all facilities shops/restaurants within walking distance. The main entrance to the complex is a beautiful atrium, the reception in the building provided services such as: accept packages, dry cleaned clothes, ironing services, arrange a driver for your car, car washed, etc. Fitness available for the residents. - Rental price is Incl. TV and internet.